Still getting spiders with 42 hitpoints when summoned by spider queens at high level, have a saved game file if anyone needs it. same here, that is why i was quite surprised everyone says that they are useless. Is it/will it be possible to not replace? I'm not a big fan of that. Anyway, Groove town looks good. Is it/will it be possible to not replace? Some days ago, i downloaded grove_town beta version, but when i installed it, it changed the fortress, can you help me? I would like to have all the heroes 3 towns, the cinflux and the grove too. Edited by gnollking at 15:46, 25 Jan 2010. There is no way to have it as a completely new town at the moment.. It would be really great to have it as a completely new town, but.. We do not have the knowledge . @EDIT, So, Salamandre's post was deleted . There is a very well done and scripted polish map for WoG out recently. Is anyone of the guys here interested to translate it? Would be great. I tried this town but then deleted it instantly. I think you can't have a town with no flying unit. The number of flying creatures and shooters should be at least 3 (although the ideal is 4) and this town has only two shooters (and not particularly strong ones either). Fortress is a way stronger town. I hope the new Bastion town has not the same problem as I noticed that the units there are also ground units (most of them) and I don't see any of them as a shooter. Furthermore, the graphics are a bit bad, but that's understandable since it's is a beta version. There is only one shooting unit in Fortress. And the level 4 Shooter CAN fly. I mentioned that the ideal number of flying units and shooter is 4 or up. Fortress was indeed weak compared to some other towns but I think Grove made matters whorse. Furthermore, a shooter that can fly? That's a little redundant isn't it? Anyway they should make at least one creature flying. They made one creature fly . The shooter. Why don't they make another one then? 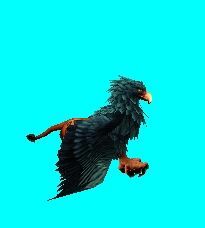 Since the town is obviously inspired by Warcraft, they could make some Hippogryph riders. But unlike Warcraft NOT SHOOTERS. It's silly to have the shooter flying. Anyway, It's a good idea and they should add Hippogryph. Yes, if they'll ever finish the project..
Edited by Mitabrin at 21:14, 27 Jan 2010. Never thought to take the WOW one? It has stand on floor (kinda, if you set it well, wings have to be edited a little)) and then it flies. I was thinking to extract it one day, because the white variant is awesome.